Vocalist La Say’s beautiful melodies, the funky groove and emotional solo breaks make for a magic track, as connoisseurs of Andre Solomko (Vinyl Jam) know. This is a story of memories, brought to life when sifting in dusty old crates. 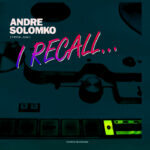 Needless to say, the Andre Solomko trademark – « AAA, Analogue analogue analogue » vibe is still heartfelt, the sound is big and timeless as ever. Everything was done exactly like in the good old days, when things were still authentic.